Most people have some sort of debt, whether it is credit cards, mortgage, car loan or student loans. But how do you know when the debt that you’ve got is too much? Do you lose sleep at night worrying about how you’re going to pay your debts? Are you suffering from anxiety, depression or any other physical or mental ailments because of your debt worry? “Carrying debt is stressful. Carrying debt that you can’t afford and worrying about how you are going to pay for it is anxiety-producing,” says Jeff Schwartz Executive Director, Consolidated Credit Counseling Services of Canada. 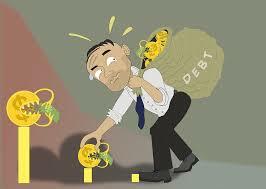 “Debt anxiety can manifest itself with physical and mental symptoms. If your debt is at the point where it is causing you that much stress, that is a definite signal that you need to take control of your debts,” says Schwartz. Do you live paycheque to paycheque? Are you stretched so thin that you are routinely living paycheque to paycheque? If you have little or no money left at the end of your pay cycle, one of two things is to blame. You are living without a budget or your debt obligations are too much to handle. Responsible financial management starts with keeping emergency savings on hand to cover unexpected expenses. If you’ve been unable to put money every month into savings, chances are your debt payments are too high and your cash flow is an issue. Putting money in savings is actually an important part of keeping your debt load low. Do you keep applying for credit but get turned down? It might be because you have bad credit, or because you don’t have a long enough credit history. It’s also possible that your debt load is too high, or that you are maxed out on your credit products. Both of those will lower your credit score. If you are worried that you’ve got too much debt, do the math and find out by calculating your debt-to-income ratio. The debt-to-income ratio is a measurement that lenders use to measure your take-home income in relation to your debts. The higher the ratio is, the harder it is for you to afford your debt payments, because you don’t have a whole lot of wiggle room. Realizing that you’ve got too much debt is the first step. Next, you’ve got to devise a plan to regain control. As a first step, gather all the information you can about how much you owe. Next establish a budget to make sure you don’t spend beyond your means. You can either try to pay debts off on your own one at a time or consolidate them, or perhaps you would benefit from credit counselling. Do you have too much debt? Call us at 1-888-294-3130 or check out our free online debt analysis.